Sadly, we’re running out of our gorgeous farm-fresh perfectly organic eggs that I stockpiled in the fall, so I’ve had to buy the Certified Organic eggs from the natural foods co-op. Take a look at the vast difference in yolk colors: Certified Organic on the left; homegrown from hens who scratched for bugs and weeds on the right. Better get some more eggs at the farm soon. Get going, girls. 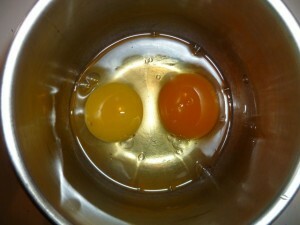 Even the Organic co-op eggs don't compare in color, texture or taste to home-grown. Brandie: Thanks for stopping by our blog. I don’t do anything particularly special to “stockpile” eggs. I am lucky enough to have a root cellar in my basement that stays about 35 degrees F. most of the winter, so I’m happy to store eggs down there for about a month. I do my best to keep them organized so we eat the oldest ones first and, of course, the older ones (that are still good) make the best and easiest egg salad. I also keep at least 3 dozen at the regulated temperature in the fridge at most times. It is almost Feb. and I haven’t cracked open a bad egg yet. Rarely one might be a little runnier than usual, but that’s to the dog’s benefit, as she loves them! Thanks again for reading, and let me know if there are any topics you’d like to see addressed!